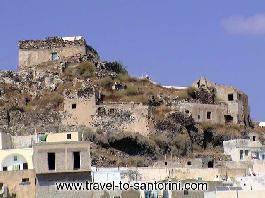 Akrotiri is 15 km from Fira.It is a small village built around the walls of the Venetian castle. Even today the protected, by the wretched throughout the years walls, small castle-town keeps an atmosphere of old times. One of the most important archaeological sites in Greece is in Akrotiri. It is the prehistoric settlement that was discovered by the archaeologist Spiros Marinatos in 1967. In this area was found a whole city under lava and ashes. According to the findings the city flourished around 3000 BC and was ruined by the explosion of the volcano in 1500 BC. A few minutes hike from Akrotiri will take you to the famous Red Beach. Huge red rocks and reddish pebbles compose an unforgetable scenery. The Red Beach is organised and widely known as an extraordinary physical phenomenon.